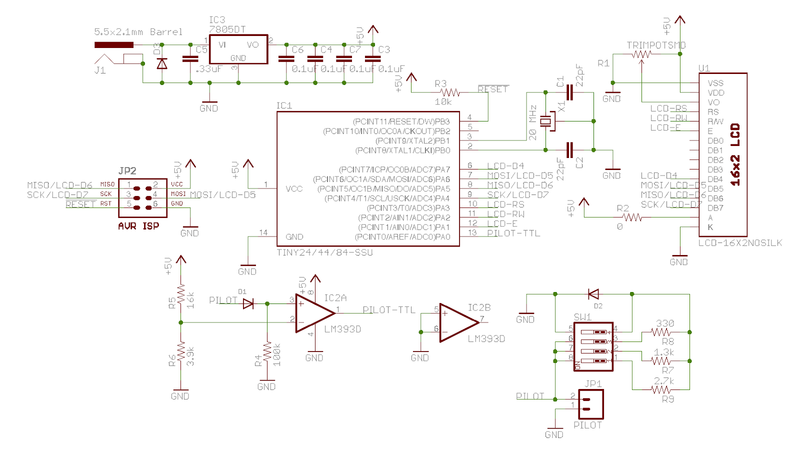 I've been selling the EV Sim Mark II for a few months now, and since I've been making a lot of "backpack" projects lately, and because so far as I know most folks who buy an EV Sim II hook it straight up to an RGB LCD backpack, I've decided to try and simplify the hardware for the most frequent use case, so I've come up with an ATTiny84 backpack. I've built and tested the prototype, and it works perfectly. It's for sale in the store now. Is it an open Source project? and will the sketch be available somewhere ? Or is this version only available as a product in the store.. The sketch is GPLed. It's on GitHub. Look in the Hydra repository. Great! got it build and working. The value of R2 is not defined on the PCD and the sketch, I used 220R for it to get it working. R2 depends on your LCD. For the LCDs I've been sourcing from DigiKey, the correct value is actually zero ohms, but rather than omit the resistor entirely I have a pile of "0 ohm" 0805 resistors I use. That way the board design is more flexible. The Dojo Reflow oven button! LCDuino is ready to go! Step right up, don't be shy!